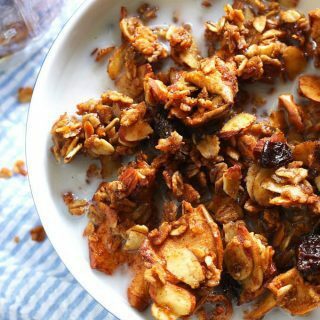 Apple cinnamon raisin granola is the perfect snack or breakfast! 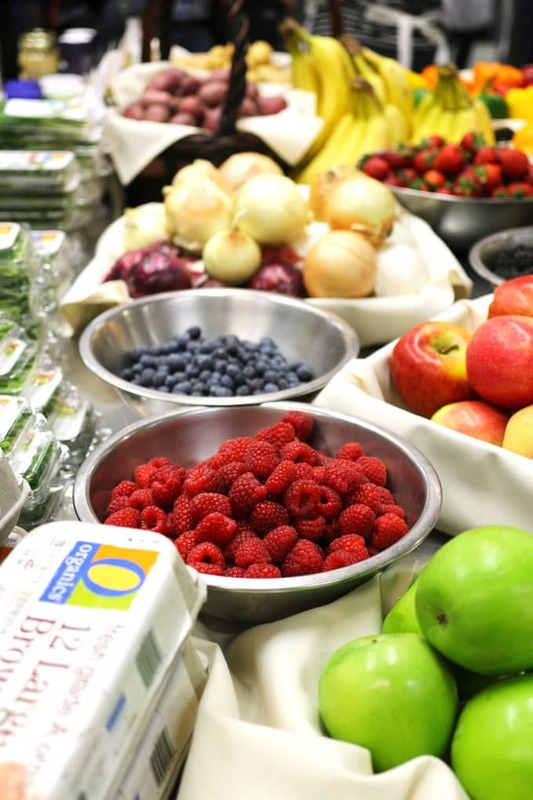 It’s easy to make and the perfect way to experience Jewel-Osco’s O Organics® USDA-certified organic products. There’s nothing I like more than a delicious snack. Well, that’s not true. I also really like a delicious breakfast. 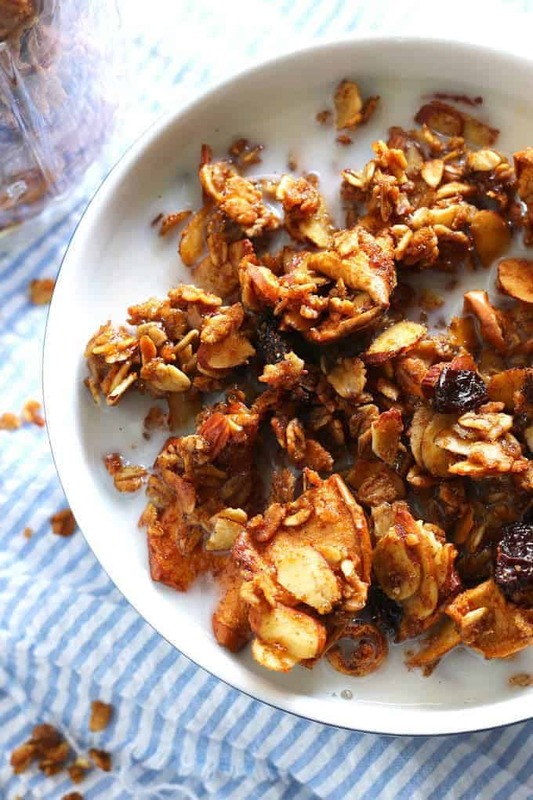 Enter this apple cinnamon raisin granola. It fits both of those categories and is also super easy to make. It’s become my favorite way to start the day! 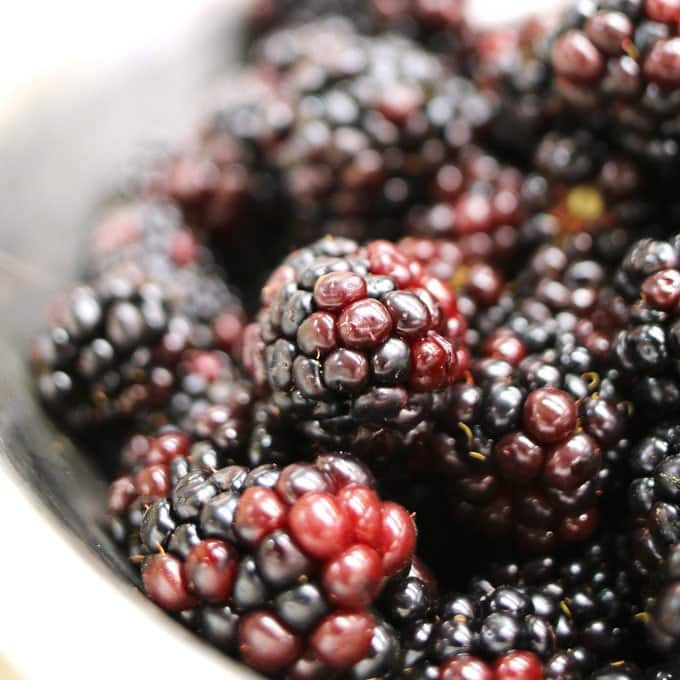 The idea for this recipe came to me when I went to the O Organics event at Kendall College. I love going to food-related events; I like it even more when they are about living a healthier life. I am always early to events and this one was very close to me so I was the first to arrive.Which was kind of awesome, because I got to be the first person to start on breakfast! At least once a week, we should all eat overnight oats. I didn’t realize how delicious or fun it would be. All the toppings! After some welcome remarks, we made our way to one of the Kendall College kitchens. There, Registered Dietitian and Nutritionist, Annessa Chumbley demoed several recipes and gave us some wonderful wellness tips. 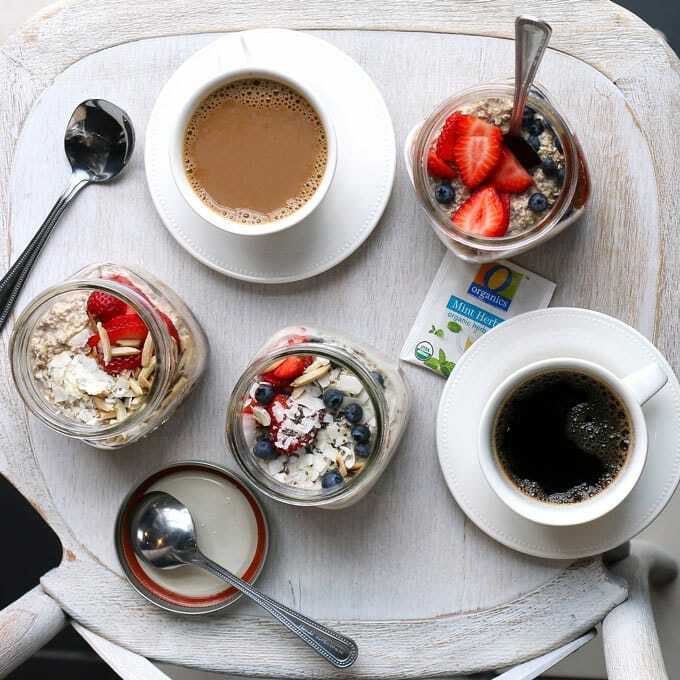 Did you know oats are a powerful cholesterol lower? And if you’re looking for a great nightcap, try boiling water, lemon zest, a splash of lemon juice and some raw apple cider vinegar. After the demos, we made our way to the Rick Bayless Test Kitchen. I’ve been in a lot of commercial kitchens but this was amazing. We pretty much were given free-reign to make our own recipe using all of the O Organics line. Fresh produce was also abundantly available. It was Christmas for food bloggers. 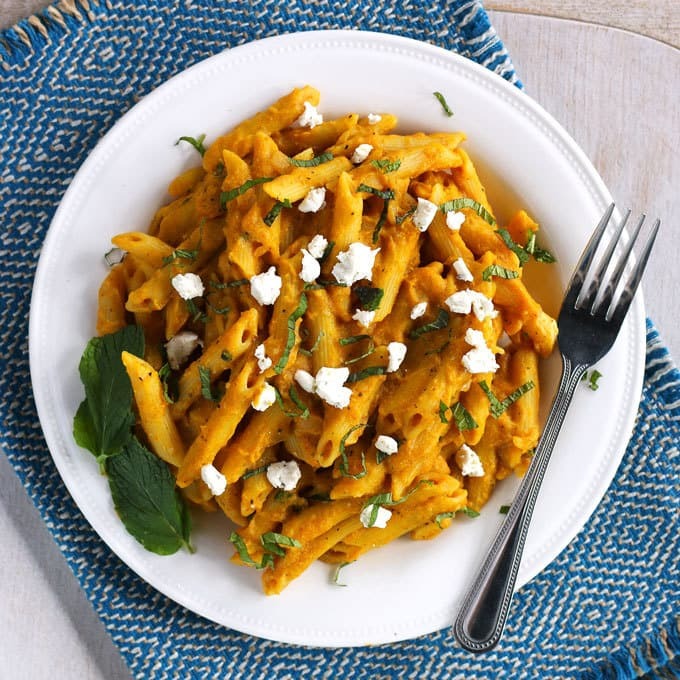 I was really feeling the autumn vibe, so I made a one-pot pumpkin curry pasta with goat cheese and mint using O Organics products! After we all cooked our unique dishes, we headed up to photograph our creations. We also were treated to a delicious Organic for AllTM lunch featuring many delicious O Organics dishes. As you might imagine, by now I was quite full. Perfect time to do some yoga! I had never actually done yoga before so I was looking forward to it. It was relaxing and the perfect to end this amazing event! 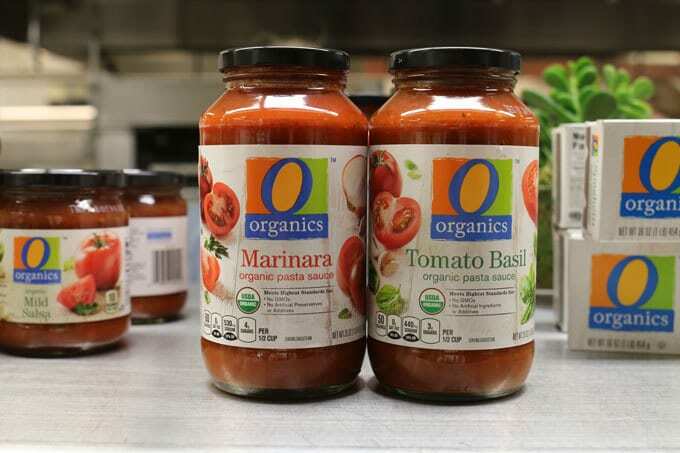 I get my O Organics products at Jewel-Osco, but if you are outside of the Chicago area, O Organics products are available at Albertsons Companies stores across the country, including Albertsons, ACME Markets, Vons, Safeway, Shaw’s, Tom Thumb, Randalls, Pavilions and Star Market. Making homemade granola is so much easier than you think. It’s similar to baking a cake. Mix your dry ingredients together, mix your wet ingredients together, then combine. 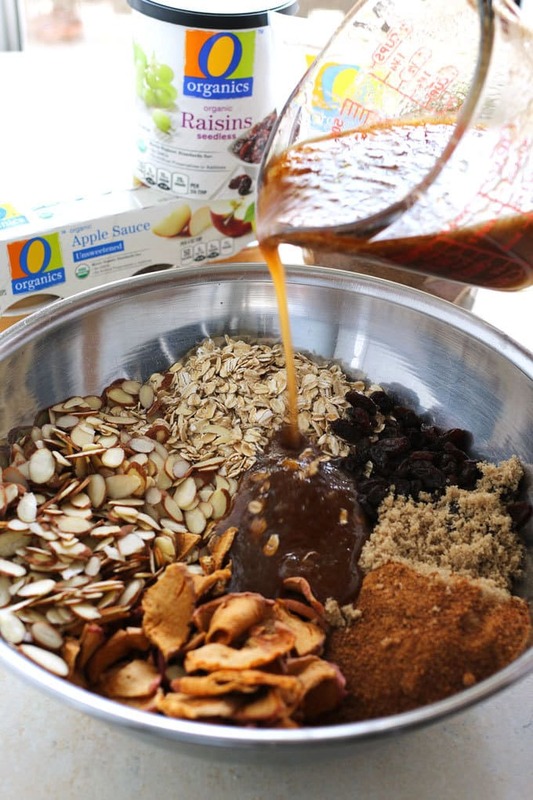 This apple cinnamon raisin granola uses old fashioned oats, dried apples, O Organics apple sauce, O Organics raisins, and a mix of O Organics coconut palm sugar and brown sugar. 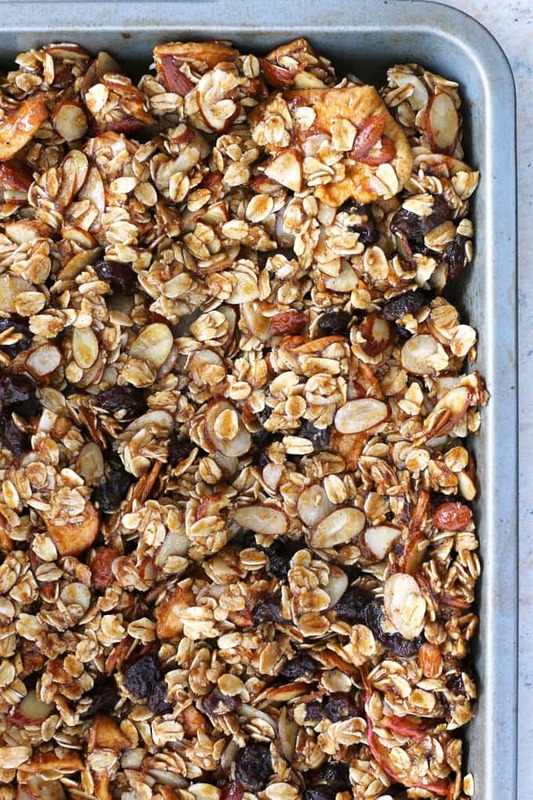 After you mix all of those ingredients together, spread the granola out on a baking sheet. You are going to bake it for 1 hour 15 minutes, in 15 minute increments, stirring each time so that you get an even bake and so the granola doesn’t stick to the bottom of the pan. After it is done baking, let it cool completely before breaking it in to large pieces. I store all of my homemade granola in large jars. Eat it as a snack, or for breakfast. I suggest a little almond milk! Apple cinnamon raisin granola is the perfect snack or breakfast! It’s easy to make! 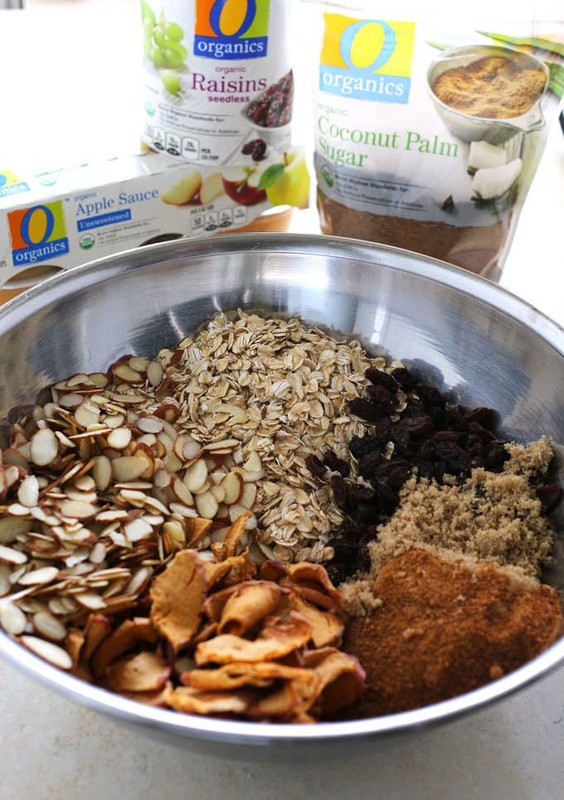 Pre-heat oven to 250 degrees F. In a large bowl, mix together the rolled oats, apple chips, almonds, raisins, brown sugar, and coconut palm sugar. Set aside. In a small bowl, combine the remaining ingredients until well mixed. Then pour the wet ingredients over the dry ingredients and toss/mix until the dry ingredients are wet. Spread the mixture on a baking sheet and put in the oven. Bake for 1 hour 15 minutes. Every 15 minutes, remove from the oven and stir the mixture to evenly bake. Remove from the oven and allow to cool before transferring to a container. It looks like you have a great time. That produce was amazing just like this granola. It reminds me of a good ole oatmeal and raisin cooking! What a fun trip! And that granola looks so amazing delicious. I absolutely adore these products! Lucky you to attend such a fun event! That granola looks sooooo good, I’d love a big bowl of it right now! Looks like a fun time and that granola is mouth-watering! I just love a good homemade granola, and this one looks fantastic! 🙂 Love that it is healthier too! I wish I had had some of this to go on top of my yogurt this morning! 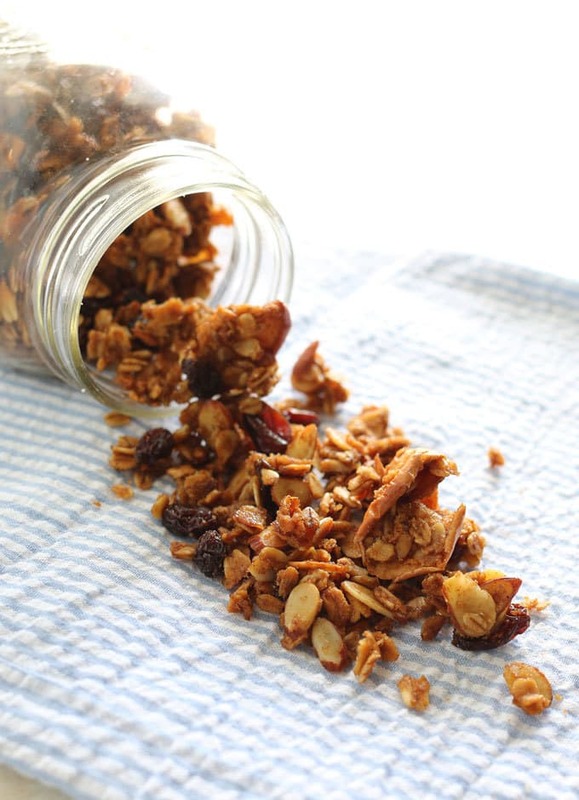 I love homemade granola like this! 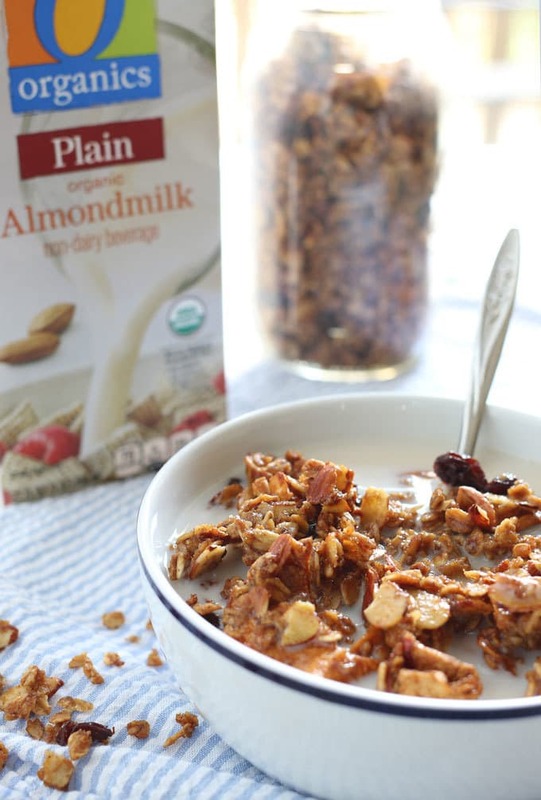 I love homemade granola and I’m putting this one at the top of my list to make soon. These flavors are so perfect for this time of the year. Great recipe! Thanks for sharing! Stopping by from Create and Create. Looks totally delicious – pinned for future use!! Thanks for sharing on the What’s for Dinner link up and don’t forget to leave a comment at the party – Next week’s features that also leave a comment get pinned, yummed and tweeted! Sounds yummy! Thank you for linking with us at #HomeMattersParty . We would love to see you again next week.